Learn all about Loch Ness Pools! For over 30 years, Lowell Brauser and Loch Ness Pools have been leading the way in swimming pool construction. With a degree in landscape architecture, you can be sure that Lowell has the experience and knowledge to make your backyard designs a reality. There is no challenge that the Loch Ness Pools staff can’t overcome. Loch Ness has designed beautiful pools in Oklahoma City, Edmond, Midwest City, Mustang, Yukon, Stillwater and Norman. We understand the unique challenges of Oklahoma landscapes. “Getting away from it all” can be as easy as walking out your back door! We have over 65 different sizes, shapes and styles of fiberglass swimming pools to choose from. Our innovative in-ground pools feature steps and seating, spas and vanishing edges, even tanning ledges! All pools are available with optional jets for therapeutic massage built right in. 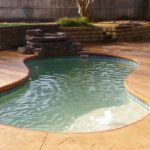 We tailor the fiberglass pool to your needs.